1.) 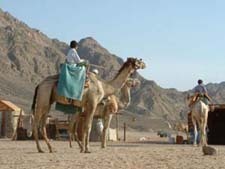 Starting from Dahab: Heading for the Blue Hole – Camel Ride along the coastline till we reach the Protected Area & Bedouin Settlement of Ras Abu Ghaloum. Lunch & snorkeling at Ras Abu Ghaloum. Upon request: visit the Lagoon. Back to Dahab along the coastline in the late afternoon. 2.) Starting from Ain Khudra: Camel Ride to the White Canyon & trekking through the Canyon. Lunch at Ain Khudra Oasis. Afternoon ride to Nagib el Hamedad and Wadi Ghazala. 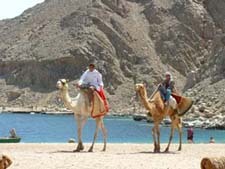 Starting from Ain Khudra: Camel Ride to the White Canyon & trekking through the Canyon. Lunch at Ain Khudra Oasis. Heading to the Closed Canyon. Spending the night under millions of stars in the area of the Closed Canyon. Morning Camel Ride to Wadi Disco. After, climbing Jebel El Melehes. 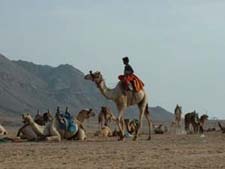 Starting in Wadi Zaghra: Camel Ride to Wadi Hamam. Lunch in the Wadi. We follow the long Wadi till its end. Having dinner there and spending our first night under millions of stars. 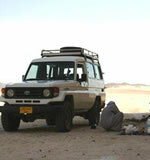 Next morning we head to the white dune El Bagar. Later Jebel El Makharoom for lunch. After we visit Bir Safra. Spending our 2nd night outside in Azarnough. Morning Camel ride to Wadi El Hudej. Enjoy the big sand dune El Hadudeh & having lunch. Afternoon Camel ride back to the street.